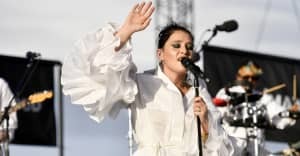 Jessie Ware will release her new album Glasshouse next month. The album features the singles "Midnight" and "Selfish Love" as well as "Alone," which premiered on Wednesday. A full tracklist for the album can be seen below. Glasshouse is the follow up to Ware's second album, 2014's Tough Love. She released her debut Devotion in 2012. It features a collaboration with Paul Buchanan of Scottish band The Blue Nile. "Stay Awake, Wait For Me"
In addition to the album announcement, Ware will tour the U.K. in March 2018. Tickets are available from September 21.